Germany went through a major economic crisis in the wake of World War 1. This may well explain why Germany in the 1920s was the source of quite a range of cheaply made index typewriters that were considerable market successes. The Geniatus is a good example. This unlikely little machine appeared in 1928 as a product of (probably) the Gundka factory, that also produced the range of Frolio/Gundka index typewriters. 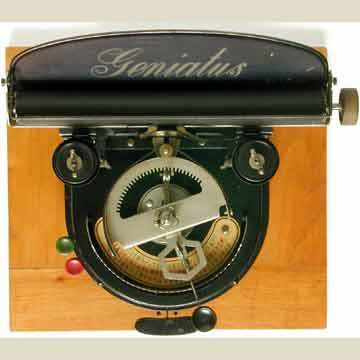 The Geniatus looked slightly more impressive than the Gundka but the machine printed with a simple strip of rubber type, attached to the outsides of the swinging sector on top of the machine. The printing point was behind a fixed roller in front of the sector (pic 6). Characters were selected on the semi-circular index card. The two keys on the left were the shift and space keys.